On February 10, 2012, Ronald McDonald held court in a packed elementary school auditorium. Ronald was visiting the Lexington, Kentucky elementary school as part of his sweep of that state. The visits are meant to teach “the value of leadership and community involvement,” says Ronald, and kick off fundraising drives for Ronald McDonald Houses. According to WheresRonald.com, he’s planning to visit at least 117 more schools there this year. What mom would imagine you send your kid off to school only to discover an all-school assembly has turned into an advertisement opportunity for a fast food chain? Today, junk food marketing happens in so many places, and in so many ways, that it’s often behind parents’ backs and beyond our control. This school assembly is just one way McDonald’s does marketing. This Mother’s Day moms are telling McDonald’s, with the help of the advocacy group Corporate Accountability International, that they’re not lovin’ it. Marketing junk food and drink to kids is big business. McDonald’s alone spent close to $1 billion on advertising in the United States in 2011. Forty percent of this on marketing directly to kids. We know this food marketing works: it gets kids to prefer McDonalds and to just eat more—period. With diet-related illnesses afflicting so many young people, marketing to kids and teens is downright dangerous. I talked about all this at a TEDx event earlier this year. My point was simple: If we want to improve the health of children and teens and turn back the epidemic of preventable illnesses, like heart disease, diabetes, and more, we need to talk about marketing to kids. Some people, when they learn about all the ways our kids are targeted, still insist it’s up to parents to make the right choices. Just turn off the TV. Talk to your kids about ads. Wisen ‘em up. Don’t blame McDonalds if your kids don’t eat right. This argument sounds reasonable. As a mom, I couldn’t agree more: parents should take responsibility for their kids’ health. My two girls take their cues from me—at least I hope they do!—perhaps nowhere more powerfully than in the kitchen. That’s why I work hard to put good food on the table and keep junk food out of the house. I seek out stuff without high-fructose corn syrup, colorants, and additives; I analyze labels, shop at farmers’ markets, and choose organic when I can. You get the idea. But this is the thing: The ways the food industry now targets kids are so pervasive and the tactics so deceitful that even the most diligent parent cannot prevent their kids from being inundated at the most impressionable stages in their development. Even schools are no longer havens from marketing. The food industry advertises in gyms, yearbooks, and playgrounds. They’ve succeeded in getting ads in school buses—and Ronald into school assemblies. Corporations sponsor school curriculum, like the Oreo Cookie Counting Book, Skittles Counting Book, Pepperidge Farm Goldfish Counting Fun Book. No offender is greater than McDonald’s, who has written the script on this tactic. One McDonald’s first-grade program asks kids to design a McDonald’s restaurant and provides information about applying for a McDonald’s job. If your jaw is hanging open right now, you’re like me: I was stunned when I first learned about it. (Corporate Accountability International’s “Clowning With Kids’ Health” is a great source for more jaw-dropping examples). McDonalds also has a long history of using charity as a form of marketing—and reaching kids. The corporation is a “platinum sponsor” of the 2013 Washington State Parent Teacher Association convention, for instance. Partnerships like this warm up the “gatekeepers”—McDonald’s own internal descriptor for “mothers”—to a brand that is a big negative for their children’s health. Then there’s “McTeacher’s Night.” The corporation puts teachers behind the register for a night and, in exchange for their free labor and in-school promotion of McDonald’s, donates a percentage of the evening’s profits to the local school. Though dubbed as “charity,” McDonald’s is the one getting the real benefit: The typical take for schools is only about $800 or the equivalent of a Saturday morning car wash sans the junk food marketing. Meanwhile McDonald’s gets the benefits of associating with role models like teachers and parents. To make matters worse, other corporations are taking McDonald’s lead. McDonald’s supplier Coca-Cola, for instance, has the popular My Coke Rewards program, which offers points for Coke products purchased. Some PTAs are now pushing My Coke Rewards as a fundraising tool, and the Coca-Cola website has a prominent way to donate to your school. Never mind this essentially means turning school communities into a grassroots marketing arm for a corporation that made $8.6 billion in profits in 2011. And yes, you can turn off the TV, but is that what kids are really watching? Kids and teens are now spending many hours online, on social media or playing videos games or interacting with apps. With hundreds of websites and apps, some targeting children as young as preschool age, the food industry has come to dominate many children’s social media and online experience. Again, McDonalds’ is leading the way. Its HappyMeal.com attracts more than a half million unique visitors during the summer months when kids spend more time at home. The site features a host of advertising disguised as games, or “adver-games.” The site even features a virtual world for children to become immersed in. To unlock “all kinds of cool stuff” in McDonald’s virtual world (the “Happy Meal gone digital” to borrow from the web site’s description) kids are encouraged to frequent McDonald’s and look for special codes found on the Happy Meal’s “healthier” items (apples with caramel dipping sauce, Chocolate Milk Jugs). In other words, in order to maximize fun in this “free” virtual space, children are incentivized to buy Happy Meals. In McWorld, “where kids rule,” buying Happy Meals is the best way to obtain, “accessories for your avatar, treehouse, or interactive pets” and visit with popular movie, comic, and TV characters. Many of these websites also ask for personal information, sometimes requiring it for viewers to engage fully in a game or offering incentives for providing it. All this can go on without parents realizing it. McDonald’s, for instance, buries the line: “Hey kids, this is advertising!” in a small font in a tree branch in the upper left hand corner of its newly revamped online platform. Perhaps most pernicious of all, McDonald’s also pays people the public trusts to serve as “brand ambassadors” for the junk food corporation. Ahead of the 2012 Summer Olympics, for example, McDonald’s amassed a group of 400 food bloggers to write positively about the chain in exchange for “free gifts and parties.” In 2010, the burger giant provided 15 mom-bloggers an all-expenses paid trip in return for their trumpeting the brand to their networks. The corporation also enlists kid-favorite celebrity athletes like LeBron James and Gabby Douglas. So you see, you can turn off the TV—hey, you could even throw it out the window—and your kids will still be exposed to McDonald’s junk food marketing, from all-school assemblies to the internet. 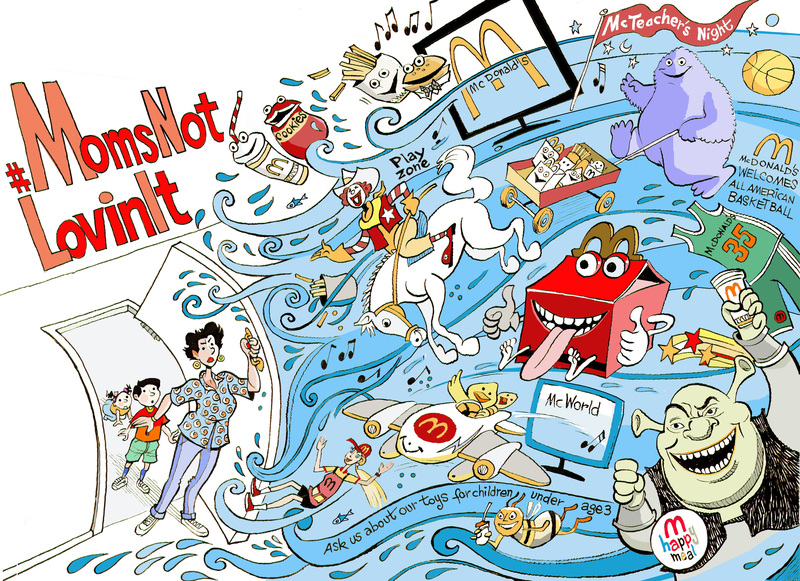 For kids today, marketing is ubiquitous—and McDonalds has been front-and-center in making it so. That’s why I’m joining moms everywhere today in calling on McDonald’s to set an example–and conclude five decades of setting a bad example—and stop marketing to kids. You can join me by sharing the image above, adding your voice in social media with #MomsNotLovinIt, and taking action at MomsNotLovinIt.org.